Or so the song goes, but for my fish tank, it’s gonna be a small world. “How small?”, you might ask. 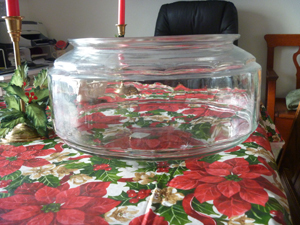 A 2 gallon fish bowl. Maybe 2.5 if I fill it all the way to the top. 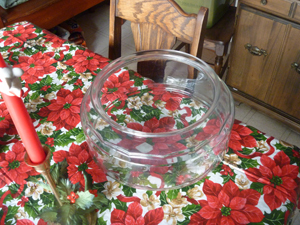 This is the bowl that was at the house. Remember, I don’t have an aquarium, stand, test chemicals, etc. So I’m looking to do an entire setup on very little money. This fish bowl was generously(?) donated to the cause. Well okay, I was told I could use it when I asked if I could have it. That’s pretty close, right? What do you keep in a drop of water? Crushed dreams mainly. On a serious note, I started to think of all what I could do with it. The majority of what I would normally keep pretty much went out the window. Not daunted by the task, I started giving it some serious thought. If you’re new to the hobby, you might be wondering what all the fuss is about. Well, when it comes to fish tanks, smaller is not better, bigger is. Often people want to start out small, see how they like it first and then take the plunge. That’s a great theory, and works for a lot of things, but not fish. A bigger tank takes less work and is more forgiving of errors. Think of it this way: if you put two drops of food coloring in a typical mug of water (about 12 ounces) and two drops of the same food coloring in a 5 gallon bucket of water, which one would you notice the color change in? For contaminates, or adding too much of a chemical, or temperature change (like in winter when you may lose heat), the small tanks will be affected first, while the larger tanks are buffered against the changes for an extended period of time (in a temperature change) or a much smaller, less costly loss of fish (with contaminates or chemicals). Yes, bigger tanks are much more costly to set up and sometimes maintain (depending on what you have in them), but compared to the amount of money you could lose to a mistake, carelessness, or ignorance, the extra buffering power is well worth it. That being said, nano reefs (very small reef setups) are fairly popular. I had one in a 10 gallon tank for a while. But really, unless you are experienced, you’re better off going as big as you can (within reason of course). It looks bigger than it is. So one of the first things I thought of was, Sea Moneys. Seriously. If you’ve never heard of them they are a hybrid brine shrimp that can still be found in some stores with fanciful creatures drawn on the packages that look nothing like brine shrimp, hybrid or not. Sparing you the math, for a two gallon aquarium it would take 21.3333 packets of water conditioner (included in the kit). That’s a whole lot of money for brine shrimp. They supposedly are larger and live longer than plain old brine shrimp, however…. In my next post, I’ll see if I can finish catching you up to where I’m actually at in my thoughts. This entry was posted in Aquarium Set up, Freshwater Tropical, Saltwater Invertebrates and tagged Amou, aquarium, Bucket Of Water, Costly Loss, Crushed Dreams, Drop Of Water, Fish Bowl, Fish Tank, Fish Tanks, Food Coloring, Fuss, Gallon Bucket, Gallon Fish, Lot, Money, Period Of Time, Plunge, Small Small World, Temperature Change, Test Chemicals.